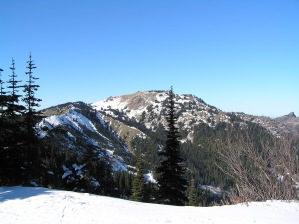 We went snowshoeing on Hurricane Ridge a few days back, and we were rather amazed at the lack of snow. There was snow, but not all that much as you can see in these two photos. Just as a reminder, these were taken in February, not June. The road to the Hurricane Hill trailhead did have snow, but the thick section near the start was deceptive. There were portions of the trail where it was easy to bottom out and poke at the asphalt of the road with our sticks. Still, the snow was white, and the scenery spectacular. If you don't have snowshoes or cross country skis, you can just hike if you have a good pair of shoes. The picture on the right is of Hurricane Hill. Most of the snow seems to have melted! There are usually bits of snow hanging around until August. Unless the heavens open up, it looks like it will all be gone by May. 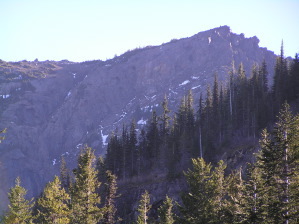 The picture on the left is of the Switchback Trail to Klahane Ridge as seen from the road to Hurricane Ridge. 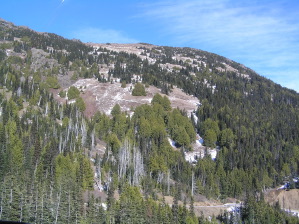 It looks like most o fhte snow has melted, but you can see the snow on the trail as the criss cross of white lines just above the center of the picture. Judging from the trailhead, it looks like you can just walk up to the ridge if you don't mind the occasional snow drift. 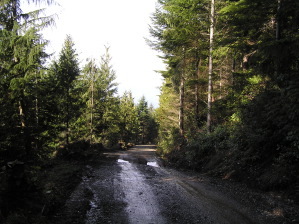 We had heard that there had been some logging at Striped Peak, so we weren't surprised to see the old trail out of the Salt Creek parking lot is now a full fledged, full width logging road. They've followed the old right of way, and it is still a steep ascent, about 960', from the playground to the high point of the trail. 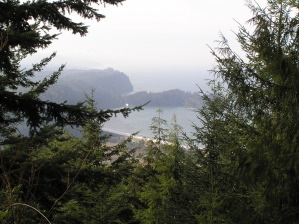 It may not feel as wild as it used to, and if they do a lot more logging, it will feel even less so, but the views are still spectacular. We figured we'd better enjoy Striped Peak for now, and hope it doesn't get changed beyond recognition. At least they haven't found any shallow mining coal. 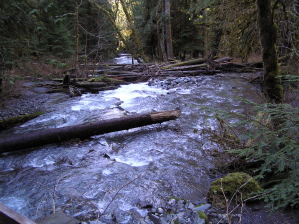 We took advantage of the excellent weather to check out Whiskey Bend and the Elwha River Trail. The dirt road that leads up to Whiskey Bend was in excellent shape, though there has been a bit of erosion. The Park Service seems to have matters in hand, and they've put in some new reflectors at one of the narrow points. We made it fine with our Honda Civic, but we're not sure we'd do it in an SUV. There was no snow or ice at the trailhead and there was none along the trail. There weren't even very many downed trees or branches which made it easier going than along the wind damaged Spruce Railroad Trail. We made it all the way down to Lilian Camp where the river is in winter roar. Still, we've heard it louder. As usual, the light along the trail that follows the river valley is glorious. 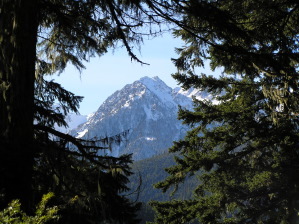 Most of the trail is in the shade, but now and then there is a glimpse of the mountains or a view up the valley. The photos here do not do the trail justice. - Just a quick note on the Five Star Cellars dinner at Bella Italia. Dave Senters outdid himself with that bollito misto. That's a lovely country dish of beef short ribs braised in red wine with cippolini onions, and it tasted even better than that sounds. 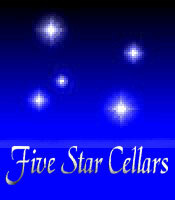 As for Five Star Cellars, they are up and coming with that big Walla Walla bramble. We were just driving through Joyce, a small town west of Port Angeles, and we couldn't help but notice the little lumber yard right along Route 112. Joyce is a rather small town, but it has a restaurant or two, a laundromat, a general store, a health club, and a video rental center. These are all smallish operations, so the lumber yard is perhaps of the proper size for Joyce. Still, we had never seen such a small lumber yard before. Even the few lumber yards we've found in Manhattan, noted for its excruciating real estate prices, were larger. Our curiosity had been piqued. Does this little lumber yard sell four by twelves, or do you have to make do with two by fours? Kidding aside, they must have a system. This is Joyce, and Joyce is in lumber country. Perhaps this is a cut your own lumber yard. We've seen self pick strawberries, self pick lavender, and cut your own Christmas trees. Why not a cut your own lumber yard? It all makes perfect sense. You pick up a chainsaw in the little building by the road, and while you're out in the forest picking out a likely looking tree, they'll be firing up the sawmill. We're not sure how they get the wood properly seasoned. Maybe they have one of those microwave wood kilns, sort of like at the convenience store, except big enough for a whole tree trunk. There is a lot of emphasis on knowing the ingredients in your restaurant meal these days. Why settle for Nieman Ranch beef, when you can meet the steer, and maybe tussle a bit? Why settle for factory farmed Home Depot lumber, when you can cut your own. It's so much more authentic. Of course, the local tree varietal out in Joyce is probably cedar, but we can almost hear the guy at the yard saying, "Redwood. Not a problem. We've got seeds." But that is another story. This has been a weird winter. 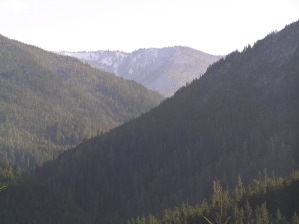 It just hasn't been snowing on the North Olympic Peninsula. This has been bad news for skiers and snowshoers, but it is great news for us hikers. 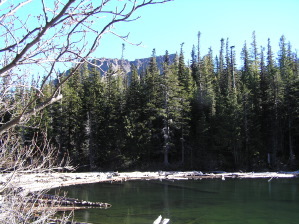 For example, the Lake Angeles Trail is clear, no snow, no ice, all the way up to the lake. 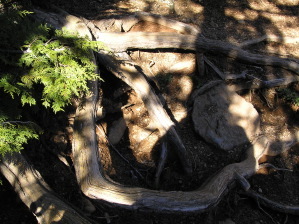 In fact, there is nothing blocking the route but a couple of downed trees that you can step right over. Up at the lake, the water is clear and the mountains majestic. You can even a little snow here and there.